A structure fragment (five residues long) is defined by the (k, a)-pair angles as shown in Figure A. The k angle, ranging from 0° to 180°, of a residue i is defined as a bond angle formed by three Ca atoms of residues i-2, i, and i+2. The a angle, ranging from -180° to 180°, of a residue i is a dihedral angle formed by the four Ca atoms of residues i-1, i, i+1, and i+2. Figure A. 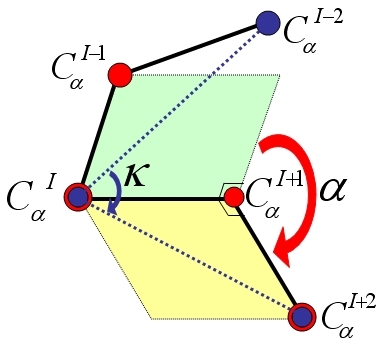 The definitions of the kappa (k) and alpha (a) angles. We aim to use structural alphabets to represent pattern profiles of the backbone fragments by clustering the accumulated (k, a)-map plot (Figure B), which consists of 225523 protein fragments summarized from the pair database. A specific serial of structure fragments, called (k, a)-map, is able to represent a protein structure. Therefore, each protein structure may form a specific (k, a)-map distribution. The accumulated (k, a)-map is similar to the concept of Ramachandran plot, which represents a residue by using angles f and y. Figure B. The accumulated (k, a)-map plot consists of 225523 protein fragments. The plot, 648 cells (36×18), is clustered into 23 groups based on the similarity of representative segments of each cell. The number of 3D segments in each cell ranges from 0 to 22310 and the color bar on the right side shows the distribution scale. According to the definitions of DSSP, the numbers of a-helix and b-strand segments are 82482 (36.57%) and 52371 (23.33%), respectively. 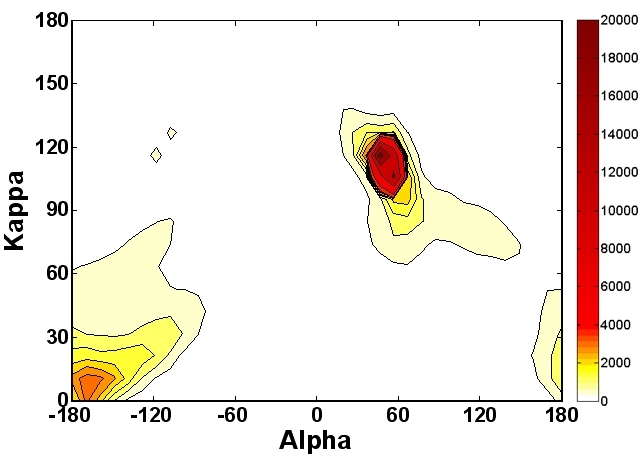 In the (k, a)-map plot, most of the a-helix segments are located on four cells in which the a angle ranges from 40° to 60° and k angle ranges from 100° to 120°. In contrast, the k angle of b-stand segments roughly ranges from 0° to 30° and the a angle ranges from -180° to -140° and from 150° to 180°. The number of the cells, which have zero segments, is 183.